The story of Billy the burro is a sad one. A lonely burro abandoned in the middle of nowhere, on Bureau of Land Management (BLM) land between Battle Mountain and Elko. Alone and unable to find enough forage and water to survive, he grew thin. His hooves grew long. He stood by the road waiting for someone to come and save him. The story of Billy is also a happy one ... a story of people from all different walks of life coming together to save a little burro who needed a friend. Employees of a mining operation became increasingly concerned about Billy. They always saw him standing by the road. He would climb into your truck if you let him, they said. Billy was very hungry, not only for food but also for companionship. The employees called the Bureau of Land Management (BLM), which manages the remote land on which Billy was dumped. The BLM wild horse specialist, Shawna Richardson, reached out to The American Wild Horse Preservation Campaign (AWHPC) about finding a home for Billy. Meanwhile, the miners became so concerned with Billy that they convinced a local ranch manager to bring him home, where he would be safe and fed until a permanent solution could be found. Everyone wanted to find Billy a good home. AWHPC knew immediately where to turn - to its coalition partner, the Center for Animal Protection and Education (CAPE) sanctuary in Grass Valley, CA. Already home to rescued burros, we knew the sanctuary would be a little slice of heaven for Billy the burro. An anonymous donor who founded The Platero Project, a program dedicated to promoting awareness about America's wild burros and keeping them wild and free on the range, stepped forward to fund the rescue. Because Billy was not a wild burro, he was not protected under federal law. As a result, he was classified as "estray livestock," and his fate was in the hands of the Nevada Department of Agriculture, which agreed to allow us to purchase him directly in order to spare Billy the trauma of being run through the livestock auction. That was one year ago. Billy is now adjusting beautifully to his life at the sanctuary. His weight is perfect, his coat is shiny - he looks so different than when he first arrived at the sanctuary as a very malnourished and depressed burro. 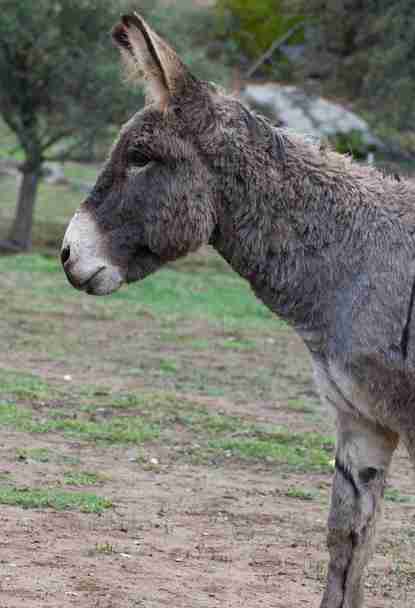 He is extremely connected to his herd of five other burros. 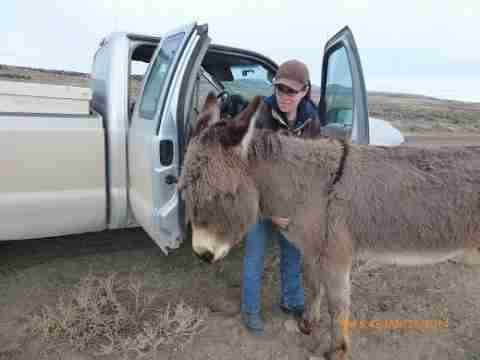 His best friend, Platero, and he are constantly playing and running around together in the burro pasture. CAPE Director, JP Novic said, "Billy has a distinctive bray that sounds more like a honking fog horn than a hee-haw. He brings a huge smile to everyone's face and we are so lucky to have him at the sanctuary." After being dumped alone, in the wilds of Nevada, Billy was rescued thanks to great teamwork by the BLM, employees of the mining operation, the manager of the local ranch, the Nevada Department of Agriculture, AWHPC, the Center for Animal Protection and Education, and thanks to the generosity of the anonymous donor. 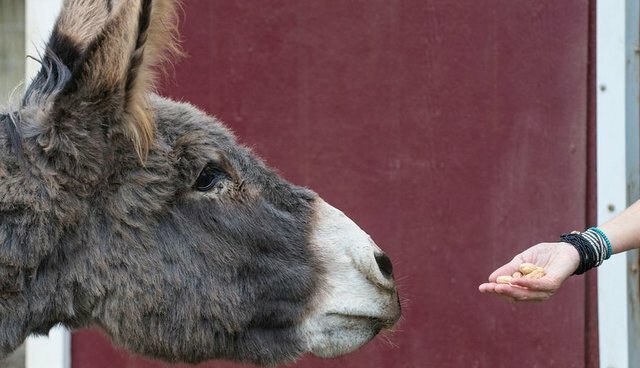 It took a village to save this little burro, and he is now living out his life at a peaceful and serene sanctuary! 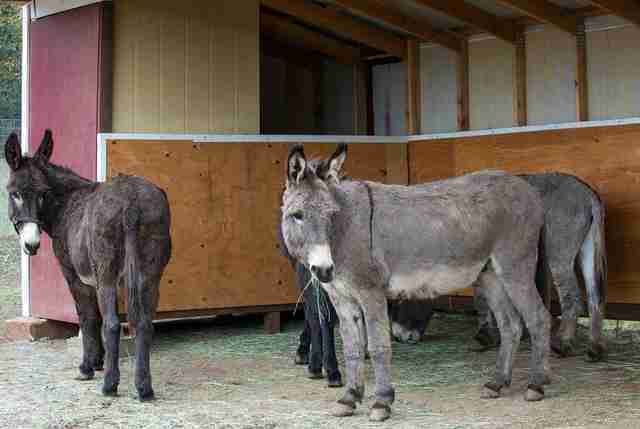 America's burros are protected by law, as "living symbols of the historic and pioneer spirit of the West," but they are facing a genetic crisis caused by small and geographically dispersed populations. This could lead to their extinction in the US. The Platero Project, funded by an anonymous donor and managed by AWHPC, is dedicated to elevating the status of burros and preserving and protecting these icons of the West by keeping them wild.